Adenoids (synonym adenoid vegetation, adenoid of razreshenia) - pathological hypertrophy third, pharyngeal (nasopharyngeal), tonsils (see Fig.) 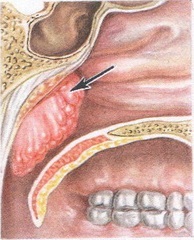 OK nasopharyngeal the amygdala is found in the nasopharynx. It is well developed in the children's age; approximately 12 years of age is lower, and in adults is completely atrophied. Adenoids are usually observed in children aged from 3 to 10 years, but can be and in the first years of life, and after a period of puberty. Causes hypertrophy nasopharyngeal tonsils are often the children's infectious diseases (re viral upper respiratory tract infections, influenza and other). Symptoms adenoids: periodic or continuous violation of nasal breathing, profuse nasal discharge, often flowing and in the nasopharynx. As a result of constant nasal breathing difficulties children are sleeping with his mouth open, sleep they often restless and often accompanied loud snoring. Because of poor sleep children suffering from adenoidally, and at dull and listless. Students often disrupted progress. Adenoids is quite often accompanied by decrease in hearing, especially during acute rhinitis. The lowering of the hearing with adenoids causes confusion and inattention of the child. In children with adenoidally considerable size is always open mouth, lower jaw often hang, nasolabial folds are anti-aliased, which gives the face of a child with special expression called "adenoid persons" (Fig.). Due to congestion in the nose that hinder the outflow of venous blood and lymph from the cavity of the skullin children older frequent persistent headaches. To diagnose the adenoids used back rinoskopia (see), digital examination of the nasopharynx and radiography of the nasal cavity after putting a contrast agent into the nose. Largest distinguish adenoids three degrees: adenoids I degree (small size) cover the upper part of the Shoe; adenoids grade II (medium size) - the top two thirds of the share (the level of the rear end of the secondary shell); adenoids III degree (large size) fully or almost fully cover the opener (the level of the rear end of the bottom shell). The value of the adenoids are best determined with x-ray. The consistency of the adenoids in children at first testovat-friable. With age and with repeated inflammation begins atrophy adenoid tissue and replacing it with connective tissue, so adenoids gradually become more dense, and shrank in size. Treatment in most cases online - adenoidectomy (adenotomy). Contraindications for surgery are diseases of the blood (especially hemophilia). Usually bleeding during the surgery is insignificant. After surgery, the child is forced to rinse your mouth with a solution of peroxide of hydrogenin both halves of the nose enter pieces of sterile cotton wool to stop the bleeding. 2-3 days prescribe bed rest. In 5-7 days the child needs special mode: excluded hot and rough food (crust of bread, crackers), irritating food (spicy, salty, sour), chocolate; contraindicated in active games, exposure to the sun. Prevention adenoids - prevention and timely treatment of diseases of the upper respiratory tract. The child should be referred to a physician-specialist in patients with severe long-term violation of nasal breathing.